In a bowl, scramble the eggs with half and half, cinnamon, vanilla and a pinch of salt. Soak each piece of bread and set aside on a plate until all the pieces of bread have been soaked. In a skillet, melt butter on medium heat. Cook the bread on one side and remove from pan cooked side up to a cutting board or plate. 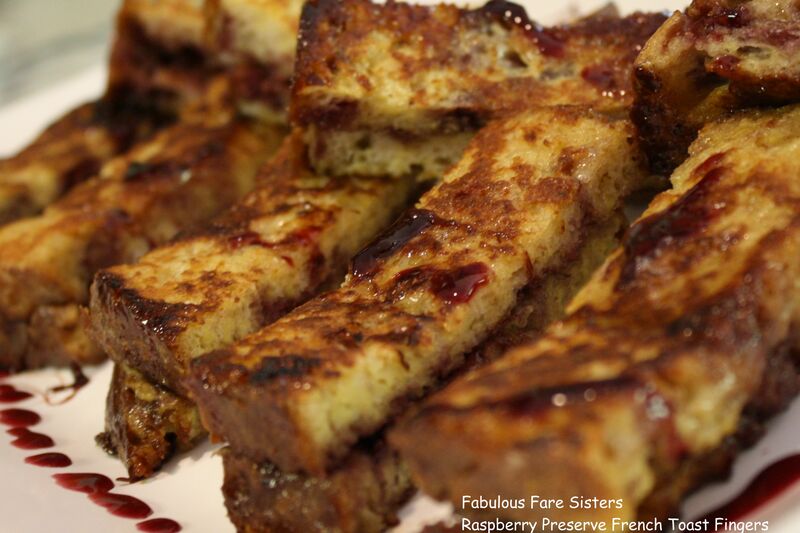 Cover cooked side of french toast with raspberry preserve and fold other cooked side on top to create a sandwich. Return bread to pan and cook opposite side. Remove from heat. Slice into finger-like sticks. Heat the rest of the preserves for 15 seconds in the microwave and drizzle over the top and edge of plate for a perfect presentation. This looks sooo good! Love the big bread! It isn’t something you eat every day… It’s special!